To say that this hike is easily one of the best in Rhode Island is a tremendous understatement. Just long enough to spend enough time in the woods and just short enough for beginners and folks with younger children. The one and a half mile loop trail has two diverse parts to it. The first meanders up and down over small hills in the remote part of the George Washington Campground and the second winds along the picturesque southern shore of the Bowdish Reservoir. To access the trailhead use the main entrance of the campground on Putnam Pike. There is currently a $2.00 visitor entrance fee that you must pay at the entrance. After paying and passing the gate, take your third left and use the parking area here behind the brown Civilian Conservation Corps cabin. From here walk along the dirt road, passing the Walkabout Trail trailhead on the right, toward the beach at the reservoir and follow the road as it turns to the left. There will be a kiosk for the Angell Loop Trail on the right. The trail, blazed white, first passes some boulders before passing a couple campsites on the left. Just ahead is a trail split with two boardwalks that cross a seasonal stream. Take the one to the left, this will lead toward the remote campsites first and leave the best part of the hike for the end. The trail then climbs uphill for a short distance. Ahead is a trail junction, be sure to follow the white blazes and ignore the side trails. Soon you will be near the top of the hill and notice a lot of ground cover shrubs. The trail then starts slightly downhill and comes to a service road. Turn right here and follow the dirt road. The road leads by the five remote campsites. These sites each have a picnic table, fire pit, and tent platform, but are for campers only and must be reserved to be used. Along this stretch is also a restroom if you feel so inclined. Just after the fifth campsite the service road becomes visibly less used and starts to look like a wide trail traversing through the tall oaks and pines. The trail continues to slightly climb uphill as it passes an area with some boulders in the woods. Near the top of the hill to the right is an unusual formation of stones. There is no indication to what they represent. The trail then leads over the last hill and the down toward the shore of the reservoir. The trail along the shore is narrower and has plenty of spots to view the reservoir. This is quite possibly one of the prettiest stretches of trail in Rhode Island. The next half of a mile is a haven for small woodland critters such as chipmunks and squirrels, waterfowl such as geese and ducks, and has an abundance of birds as the trail winds along the reservoir. If the breeze is blowing just right you will smell the campfires off in the distance. The trail then passes through a grove of hemlocks and mountain laurel just before coming to the boardwalk. After crossing the boardwalk, turn left and retrace your steps back to the trailhead. 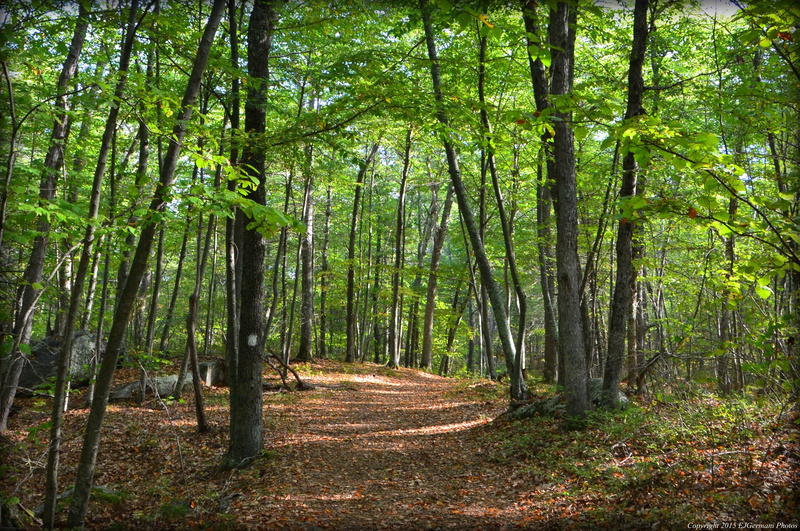 For the more experienced hiker that would like a longer walk, head over to the Walkabout Trail. There is the option of adding an additional 2, 6, or 8 miles to your hike. Trail map can be found at: Bowdish Reservoir.